Over the last few weeks, I’ve been in the midst of transitioning into my new position as a Research Fellow in the Anthropology Department at the University of Texas. As part of this process, I took a quick trip to Austin on Monday, and was happily surprised to find that a dear friend happened to be in town exactly when I was. He suggested that we go check out one of Austin’s most famous attractions: the Congress Avenue Bridge bats. A bat for your friday! I love bats. I spent a huge amount of my childhood underground, exploring the caverns of the Ozark Highlands with my father and learned to respect bats and their importance in the ecosystem at a very young age. When I was in graduate school, I began doing bat rescue/rehabilitation in southern Indiana. Through my rescue work I came to appreciate the amazing diversity of personalities, behavioral traits, and intelligence levels between bat species. I also, unfortunately, had to confront a great deal of ugliness and ignorance among people towards bats. In future posts, I’m going to do my best to dispel some of the myths about bats, and introduce you to how cool they are. But for now, here is the best place to learn some basic facts about bats. Are you afraid of bats? You don’t need to fear them any more than any other wild animal. Just be mindful that a bat on the ground may be sick. 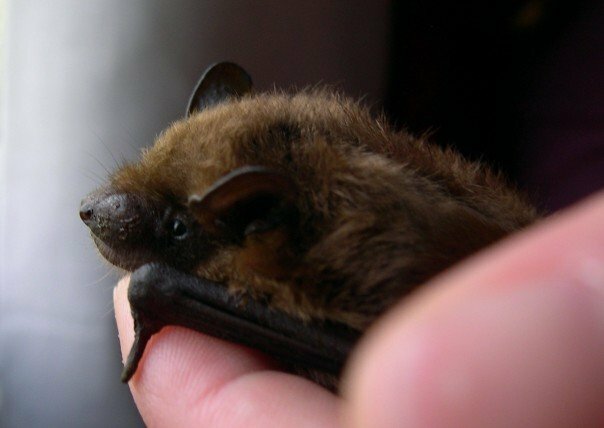 Never handle a bat with your bare hands: they are likely to bite you like any other stressed animal (and you do not want to be exposed to rabies). Bats are just as anxious as you are to avoid contact: they’re not out to attack you. Just leave them alone. If you have one in your house or find an injured one, please call a rescue person instead of harming it. Here are some bat rescue resources, or you can contact me and I’ll try to put you in touch with people who can help. Bats are closely related to primates (us), and are extremely important parts of the ecosystem. So please, let’s be good friends to these wonderful creatures!